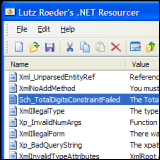 When you’re in .NET, sometimes there are resource binaries and XML file formats used within the platform. The goal of this tool is to allow you to edit those binaries and give you the ability to not only edit names, string pairs, and import bitmaps and icons, but also allow you to merge multiple resource files together from different sources. Resourcer for .NET is basically a resource editor for .NET. Another great third party development tool that is free for Windows.